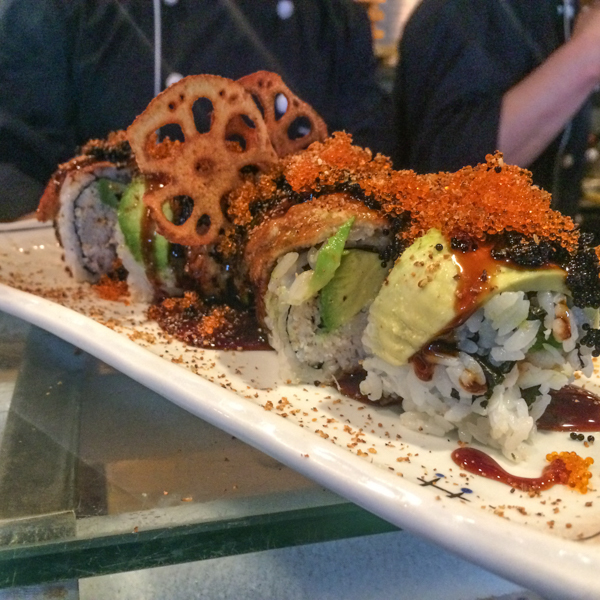 Nori Sushi is just that kind of place. 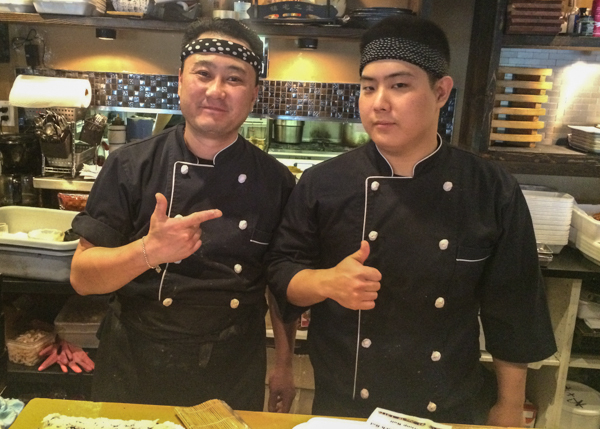 The chefs call out genuine greetings to patrons as they cross the threshold, orders are sung out from the other side of the room, the phone rings frequently, and there’s a constant happy burble of delighted diners chowing down on amazing Japanese food. And the place was already sold out for the night. In Nanaimo. On Vancouver Island. In early April. I guess offering the best sushi and sashimi on the Island in a casual ambiance with a welcoming vibe at fair prices will do that for you. Tip #1: Make a reservation for a Saturday night dinner. Yesterday they had red tuna available, so the tuna tataki above was even more melt-in-your-mouth outstanding than usual. 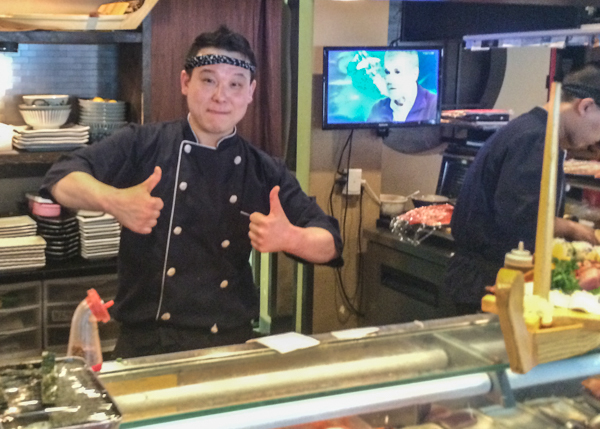 We had the pleasure of sitting at the bar where we could watch Kenny and James pull culinary magic out of plain rice and raw fish. Well, perhaps there’s a bit more to it than that. 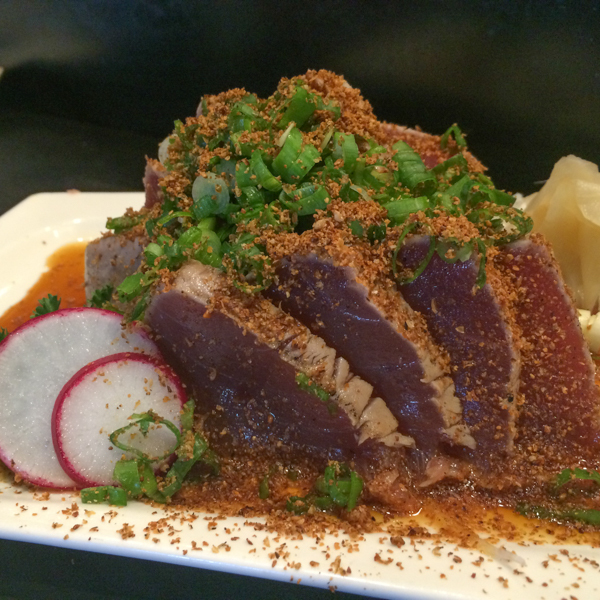 I really hadn’t planned to write this review when we first decided to nip in for lunch, so I let the delicious miso soup and tuna karrage appetizer drift away with our idle chitchat about shopping for brass hose bibs and onions. At $8.99 for the medium bottle shared between the two of us, it was a GREAT choice with our meal. 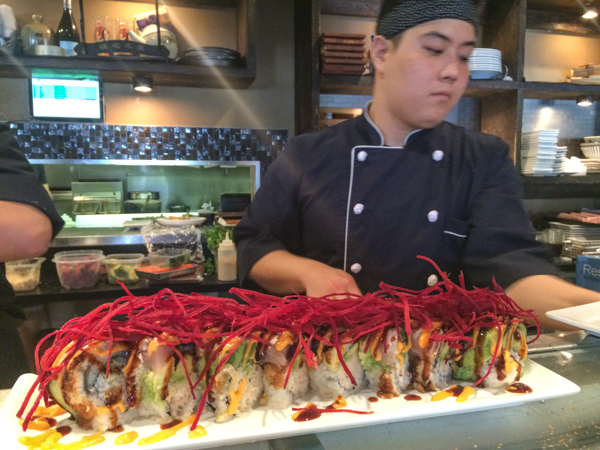 But then James set our Dragon Roll down in front of us, and I started to pay attention. At first, I was just taken with the delicate (and delicious!) flash-fried lotus root chips, and how much I was looking forward to the slightly salty “pop!” each one of those red and black flying fish roe would make in my mouth. Why, I wondered, did James use two different colored roe? Then I looked again and saw the dragon, with its mouth open wide and its lotus-root wings furled out at the base of its long neck. I asked James, and he explained that the “red” (they look more orange to me) are the regular “tobiko,” and the black are the same thing, just dyed black with octopus ink. 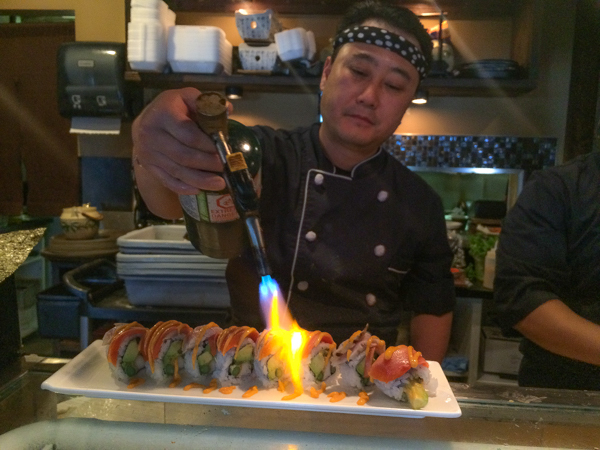 James explained that the heat works to quickly pull forth and meld the oils from the fish, avacado, and their house-made Japanese aioli. He also said several other things about why they do it, but by this time, I was into full blown “photo composition” mode and missed it. 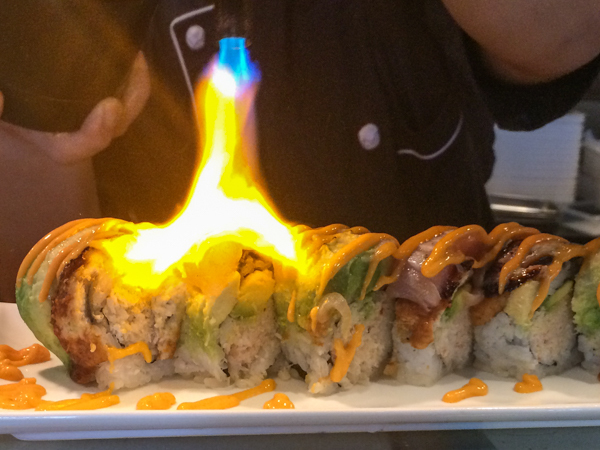 Sorry, but trust us: this is, bar none, the best sushi we’ve ever eaten, and if James says “torch it,” then torch it. 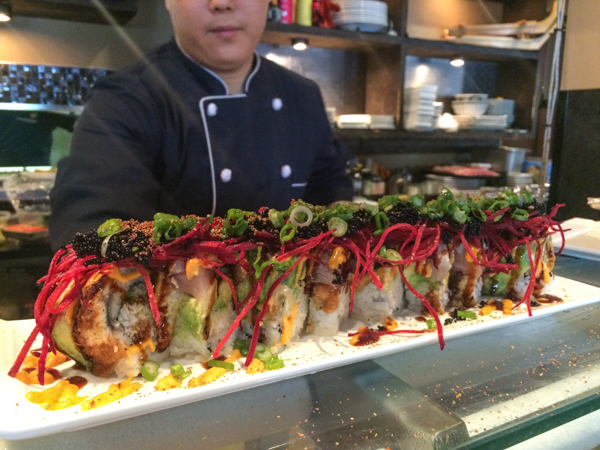 If you’re a foodie at all, the sushi bar at Nori offers front row seats at a live Cirque Du Inspiration. And more of this, too, please. 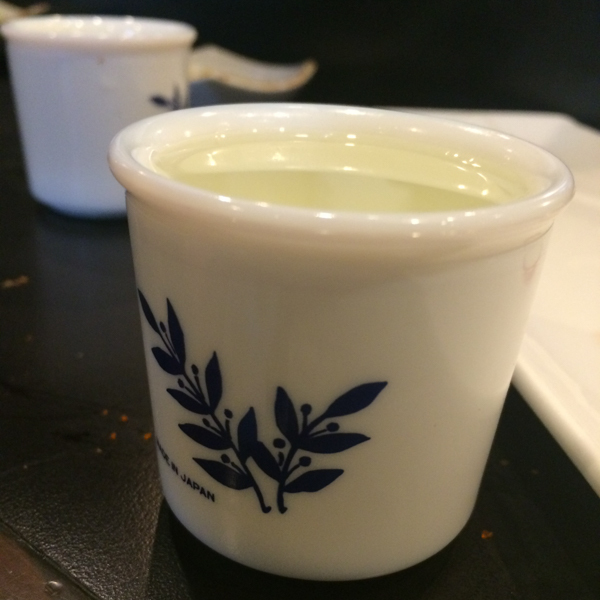 Tip #2: Go easy on the soya sauce and wasabi “dunk,” or at least try a piece first as it’s delivered to your table. 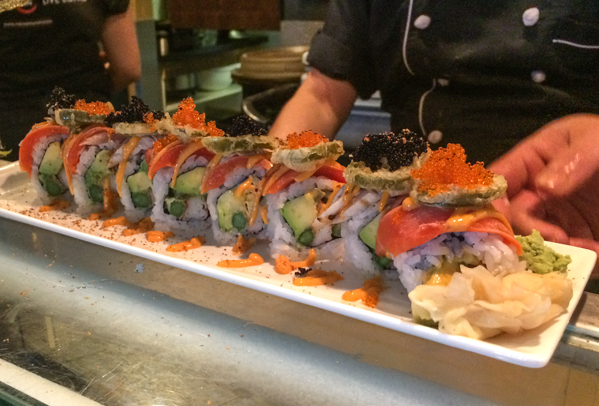 The chefs at Nori take great care to marry just the right flavors, textures, and temperatures in their offerings, and if a dish needs wasabi, it’s already there under the fish. If you habitually drown everything in super salty wasabi soup, you’ll be missing a whole world of wonderful. 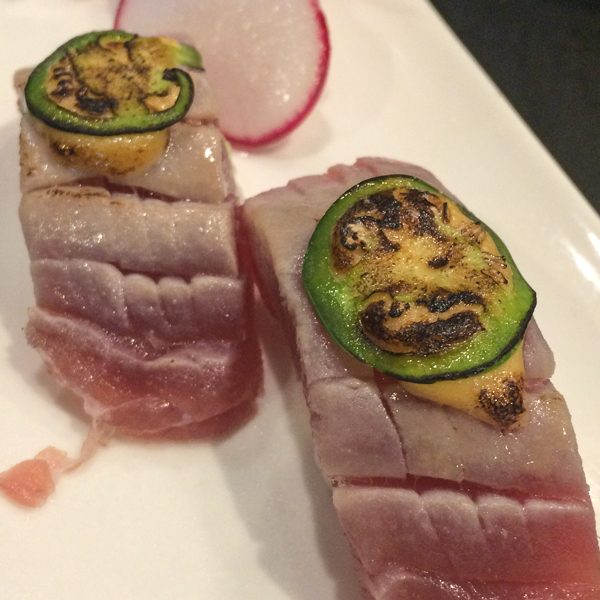 In sushi as in figure skating, chefs are scored on originality as well as degree of technical difficulty. Nori has obviously put in their 10,000 hours of practice on both. James is proud to be there. He told us he was there to learn everything he could from John, the gregarious and high-energy owner, and that it all starts with the quality of the fish. We asked James how they source their fish, and he says that it’s delivered to them, but they make their vendors compete to ensure they are always presented with the highest quality fish that’s available in our market. 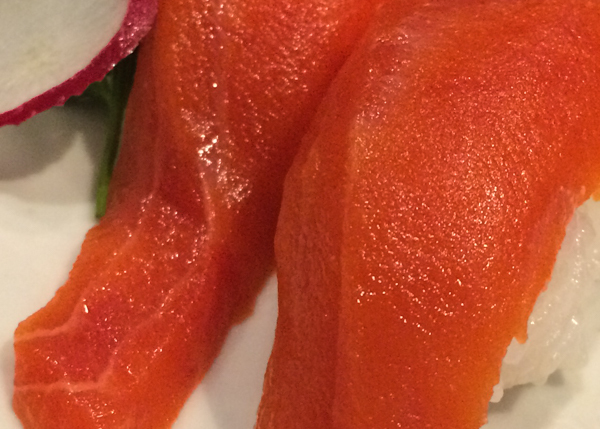 This salmon nigiri tiptoed on to our taste buds in silk-bottomed ninja slippers. Thanks, John, and your staff, for another great meal. Just one final question: when are you going to offer a cooking class? James! We somehow missed seeing your comment on this. 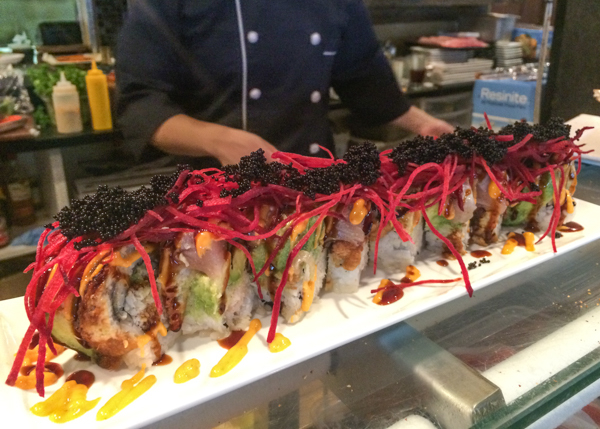 We enjoy every single experience at Nori… don’t know how you could even make it better! Oi, you’re making my mouth water! ;). I wouldn’t mind taking some classes in Japanese cooking myself. There are a few on YouTube; like how to make your own udon noodles “manually”. You want to make a good impression on the staff of a japanese restaurant; learn proper japenese table manners. Bad manners: leaving rice on your plate, using too much soya sauce at one go, NEVER make a face if you don’t like something on your plate (that’s a very rude and insulting thing to do to those who brought the food to you), say Itadikamus at the beginning of the meal (you are thankful for the meal). Yes I know, boring but they appreciate it. Not boring at all, simply considerate! Also, never feed someone else with your chopsticks. To the best of my recollection, this should only be done at funeral/memorial meals. Don’t wear perfume, cologne, scented lotions, etc. 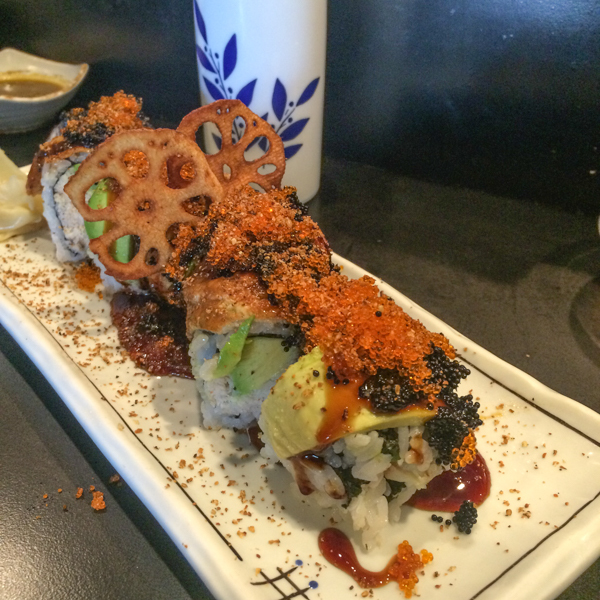 The odors interfere with the scents of the sushi (and, if strong, may cause severe discomfort to sensitive patrons). 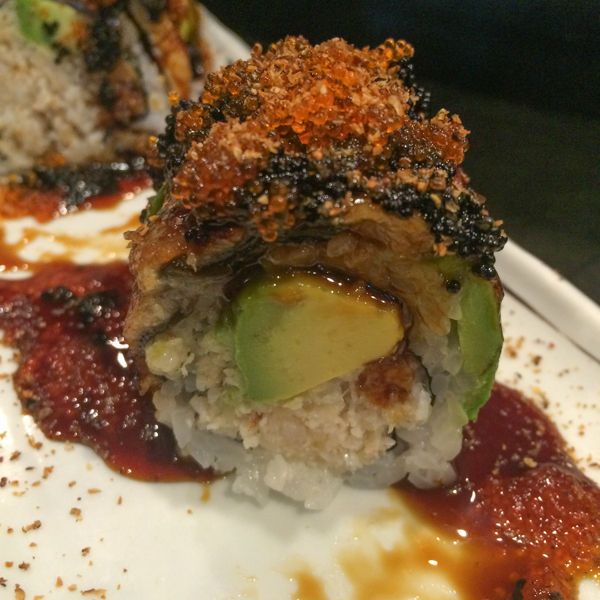 Dip your sushi (if you feel you must) fish side down. Also, place the sushi in your mouth fish side down so that it touches your tongue – you get much better flavors than rice-side down. Be conscious that other patrons may be waiting for their turn at the bar/tables. If served soup with clams, mussels, etc. in the shell, leave the shells in the bowl; do not place them in the lid (which you should never place upside down as it could be damaged), on another plate or on your tray. Eat a slice of pickled ginger after each variety of sushi to cleanse your palate. 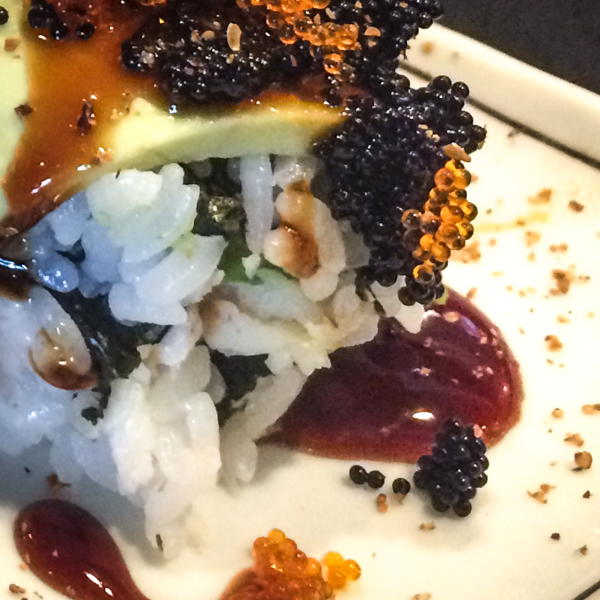 Do not mix wasabi and soy sauce – place the wasabi on the sushi, then dip it in the soy sauce (if you insist).